Whenever I hear that my niece is into something, I immediately run out and buy her a few books about it if I can. Providing kids with books that fit their interests is a great way to encourage reading and help kids develop a love of reading. I already highlighted books you can sing, which I bought her for Christmas, and I think I'll try to make this a regular feature on my blog. 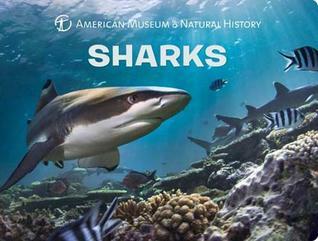 Sharks by the American Museum of Natural History (Sterling Children's Books, 2017). This is my favorite of the ones I ordered. It has real photos and lots of information. 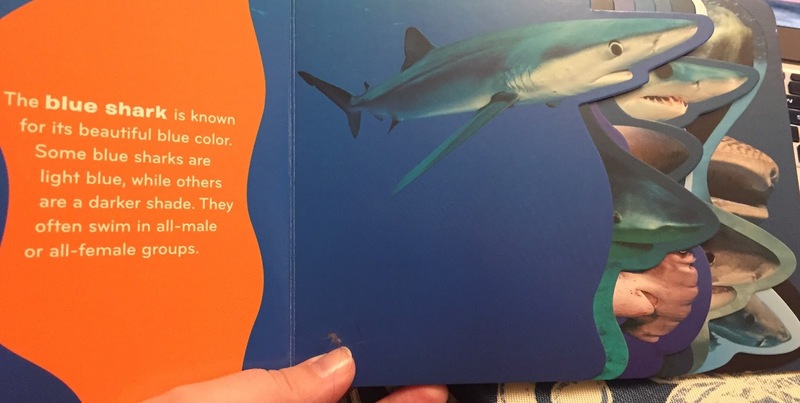 Too much information for a toddler, but we can definitely talk about the pictures together and it shows lots of different types of sharks, so there's lots of great vocabulary. The inside is awesome: each shark spread gets its own die-cut page, so it looks really cool. I think S will have a lot of fun turning the pages and exploring this book. 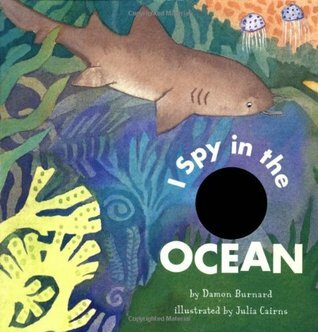 I Spy in the Ocean by Damon Burnard, illustrated by Julia Cairns. (Chronicle Books, 2001). This is a cute board book with a die-cut hole in each page to give a clue as to the new spread coming up in our game of eye-spy. Spelling out the word OCEAN, each letter features a different ocean animal: O is for Octopus, C is for Crab, and so forth. The game is probably a bit beyond my niece right now, but it's a nice introduction to the eye-spy game and I like the soft watercolor illustrations. Highlighting letters is a good way to build letter knowledge. 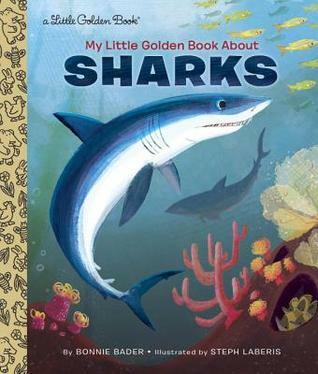 My Little Golden Book About Sharks by Bonnie Bader, illustrated by Steph Laberis (Golden Books, 2016). This will definitely be one for the library for her to grow into. It has a lot of information, including naming the parts of a shark and showing a cutaway of a shark's skeleton. Some of the illustrations are kind of scary, which I think might be too much for her right now, but if she's interested in ocean animals in a few years she may be super into them. This one would be a good choice for early elementary kids who are interested in sharks. That's what my niece is currently into and what I just bought to add to her library. If you're looking for more picture books about sharks, check out my recent Shark Storytime for some ideas.